As a new parent, your life suddenly takes on a whole new host of responsibilities. Literally overnight, you become responsible for the care, keeping, and well-being of an entire person—or in the cases of multiples, multiple persons! There are big decisions to be made as a parent, from feeding types to vaccinations to choices that will affect your family's health. Even seemingly small things, like what type of laundry detergent to buy or what car seat to install, can add up to feel like enormous decisions resting on your shoulders. The truth is, all of the new responsibility in your life may bring just a little bit of overwhelm to you, so if you're a new parent having a bit of trouble adjusting to the new level of responsibility in your life, here are a few tips on how to deal. 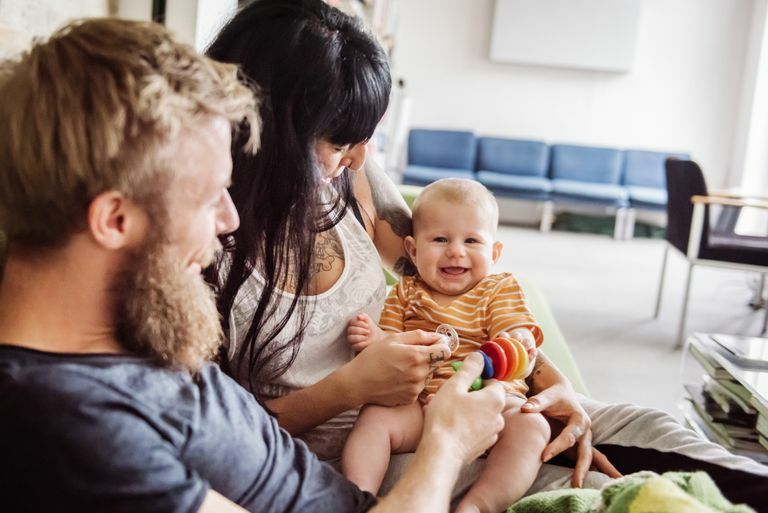 First things first: you should know that if you're having a bit of a hard time adjusting to parenthood, and even if you are dealing with some difficult emotions during the transition to learning to take care of a baby, you are not alone. It may sound like a bit of a parenting cliche, but in this case, there are actual studies that back up the fact that you really aren't alone. An October 2018 article in Sexual and Reproductive Healthcare followed 513 first-time mothers to discover what kind of emotions and emotional struggles they faced in the first three months of parenthood, typically considered the fourth trimester or newborn stage. The study used questionnaires that mothers filled out on their own. The study concluded that the transition into parenthood is indeed a "complicated period" for first-time mothers that was characterized by low confidence, symptoms of depression, and high stress. There is also good news: The study found that all of the symptoms of decreased confidence, depression, and high stress improved over time for the majority of first-time mothers. The study found that many mothers reported the highest amounts of stress and low confidence in the time period of between two and six months postpartum. After six months, however, many reported fewer symptoms of depression and higher levels of confidence. The chance was significant, with scores going from 16 percent reporting adequate levels of confidence to 23 percent between two and six months postpartum. Babies change a lot in only a few short months and as a result, so will you as parents. Just like your baby needs time to adjust to a whole new way of life, so do you as parents. Give yourself time to adjust and learn together without feeling guilty or shameful if you're finding the transition more difficult than you anticipated. "As you enter parenthood, your life will change more in that moment than any other time in your life," Tara Allen, a Registered Mother-Baby Nurse and Certified Nutritionist, Health Coach, and Personal Trainer explains. "One second you're not a parent and the very next second, you're responsible for a new human being. It's indescribable and amazing and life-altering. It can be scary, too. No matter how great you're doing, there will be times when you think it's not good enough. But it will be good enough. Babies will be children and then teenagers and then adults. They just want what we all want—to be loved and cared for. They want your attention and support. They just need you." Allen also explains that one of the challenges she most often sees new parents getting overwhelmed and bogged down with is the sheer volume of decisions they need to make, especially with that first major feeding decisions. "Breast or bottle or both? When? How often? How much? There is so much noise out there; real information, false information, family input and expectations, the fear of judgment, etc.," Allen points out. That sudden influx of decision-making can be overwhelming, especially because parents must be their baby's advocate in every single way. To combat the overwhelm that can threaten as a new parent, Allen suggests that new parents do their very best to connect with other parents, even before the baby is born. "This can be old friends, family members, neighbors, or even online forums such as a parenting group on Facebook," Allen adds. "The sense of community can be paramount to helping new parents navigate the difficult decisions as well as serve to help them feel they are not alone in their thoughts, worries, or journey." Chances are, you've probably already heard a lot about the importance of self-care, but what does self-care actually mean as a parent? Does it mean massages and bubble baths? If you're a new parent or a single parent, the answer is, probably not. Especially during the newborn stage, self-care may look a lot more simple, because even something as small as fitting in a shower can feel like a victory. But as you move forward as a parent and have to learn to balance the responsibilities of caring for your child, it is imperative that you learn that caring for your family starts with caring for yourself. True self-care means taking care of a full spectrum of your physical, emotional, mental, and financial health. You may find that you're tempted to put off the things that you normally have done before becoming a parent "for the baby." But the truth is, it's more important than ever to continue to do the things that make you who you are. Whether that's taking the time to keep your therapy appointment, your hair appointment, or just that appointment you had set with yourself to read that new book you've been wanting to read, you keep those appointments. There will probably be moments when you can't find a babysitter and it will feel like it's more work than it's worth, but the small moments of self-care will empower you to face the larger moments of responsibility in parenting. Dr. Jennifer Boozer, a Family Practice Physician at Keck Medicine of USC notes that she often sees new parents neglecting their own health—especially in terms of exercise and eating habits—the most during the newborn period of parenting. "All of [parents'] time and attention is now focused on the needs of their little one," she explains. "They are now responsible for providing around-the-clock care. Of course, this makes it hard to find time to get to the gym or cook a healthy meal." Dr. Boozer also acknowledges that many parents struggle from a lack of sleep, or finding adequate childcare in order to make it to the gym or prep a healthy meal. To stay on top of their own health and keep up their responsibilities as parents, Dr. Boozer urges parents to not rule out simply taking their little one along to the gym with them for a workout or getting creative with their workouts at home. "Regular exercise can help keep you body healthy and boost your mood," she points out. "There are many classes that involve getting active while your baby joins you in a stroller or carrier; plus, it is a good way to meet other new parents." And Allen might be a mother-baby nurse, but she makes one thing clear to all of her patients: She recommends prioritizing parental health is the number one self-care strategy in parenthood. "When we properly fuel our body with the right nutrition, get regular and purposeful movement, maximize the amount of sleep we get (to the extent that we can as parents! ), and manage the 'big rocks' of our lives such as relationships, feelings of fulfillment, and emotions, we show up as the best versions of ourselves," she explains. "We literally create energy with this momentum, and trust me, this energy will come in handy at 3 PM after a rather sleepless night up with a newborn." This can't be stressed enough: There are normal ups and downs and challenges of adjusting to new responsibilities as a parent, and there are real, clinical problems as a result of postpartum depression. It is important that you are aware of the difference. If you are struggling to get through your day, have lost interest in your normal activities of daily life, are unable to care for yourself or your baby, or have thoughts of hurting yourself or your baby, you need to seek medical attention immediately. check in with your partner or a trusted love one every month following your baby's birth to assess your mental and physical health. be sure to know the signs and symptoms of postpartum depression for you and your partner. have a number you can call right away if you do recognize postpartum depression. One of the most important things you can do as a new parent is arm yourself with a medical support team—r at the very least, one medical support provider—that you can trust. Many of the new responsibilities that you will be tasked with as a parent will be centered around your child's health and it is imperative to have someone you can turn to for guidance and support. From questions you may have about vaccination to concerns about your child's development to finding help for medical conditions, having a provider who understands your needs can make all the difference. And unfortunately, many parents simply aren't aware of their rights when it comes to choosing a medical provider or may feel limited by what their insurance options will provide coverage for. But you do have the right to interview and eventually choose a doctor that meets your needs. Finding a doctor you trust and communicate well with may require speaking to a few different doctors, but that's OK; doctors are people, after all, and you may relate better with one doctor over another. If you are having difficulty finding a doctor you feel comfortable with, ask people you trust for recommendations, scour online community sites or groups, or set up a meet-and-greet with a doctor. Remember, the doctor wants a good relationship with you and your family too, so don't feel bad to work to find that level of trust between both of you. There is one thing that is for certain about parenting: There will be moments when you just aren't sure what you should do. And in those situations, you can do your due diligence, take care of yourself, keep up-to-date on the latest research, surround yourselves with a support system you trust, and find all the resources you need. But parenting also comes down to learning to listen to your own intuition. Any doctor, nurse, or other medical expert will tell you that a mother's intuition is a very powerful thing, so you should not discount yours. Learn to listen to your intuition and follow your instincts during those times when there just isn't a clear answer. Contrary to what social media or the movies may portray, becoming a new parent is not an easy transition to make. Being suddenly tasked to take care of a new person who is completely reliant on you for every small thing definitely carries a lot of added weight and stress on you, no matter how much you love your little bundle of joy. As you adjust to the responsibilities of parenting, it may be helpful to know that studies have found that new mothers go through some difficult emotions while transitioning to parenthood, but that support from family, friends, and experts they trust can make all of the difference. Becoming a parent means embarking on a journey of learning, and in order to be the best parent you can be and handle all of the new responsibilities in your life, you will need to learn to take care of yourself, become an advocate for both you and your child's health, and have confidence that you are exactly the type of parent your child needs. Kristensen, I. et al (2018, October). First-time mothers’ confidence mood and stress in the first months postpartum. A cohort study. Sexual and Reproductive Health, (17) 48-49. DOI: 10.1016/j.srhc.2018.06.003.